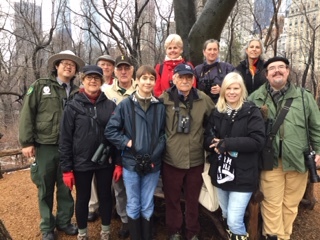 On Sunday, December 16, intrepid birders braved heavy winds and pouring rain to participate in the annual Audubon Christmas Bird Count for the New Jersey-Lower Hudson (NJLH) count circle. The NJLH count circle is centered in the Hudson River, and its 15-mile radius includes Manhattan, Bergen and Hudson counties in New Jersey, and a portion of Queens. 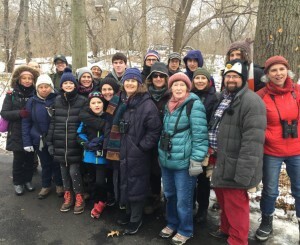 New York City Audubon organized the 119th annual Central Park Audubon Christmas Bird Count, along with our partners NYC Parks, the Urban Park Rangers, and the Central Park Conservancy. Undaunted by the weather, 59 participants joined us in the park for this annual community science project, which welcomes birders of all skill levels. Through foggy binoculars, they recorded 5,323 birds of 57 species. Most notable were the three species of owl—Northern Saw-whet, Great Horned, and Barred—all found within fifty yards of each other. The rain also kept the hawks grounded, making it easier to ensure that we did not double-count them. The much-publicized Mandarin Duck remained in the southeast sector of the park, but as an escaped captive bird, it was not included in the count totals. Only wild birds are counted during Audubon Christmas Bird Counts. Introduced species, such as the House Sparrow, only start to get counted after they have established wild populations. 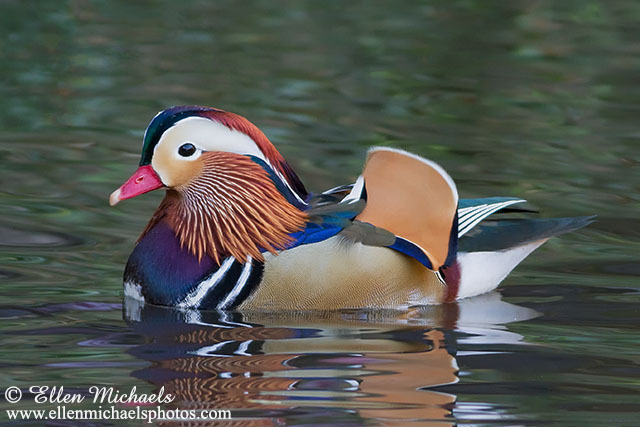 Despite not “counting,” the beautiful Mandarin Duck of Central Park was still a pleasure to see. 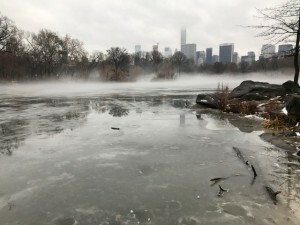 Several species often seen at the Central Park count were absent on Sunday but did show up at the park during count week (the three days before and after the count). These birds included Red-winged Blackbird, Brown-headed Cowbird, Purple Finch, House Finch, Ovenbird, and Field Sparrow. In addition to Central Park, NJLH circle counts were held Sunday at Randall’s Island, Riverside Park, Stuyvesant Town, Inwood Hill Park, John V. Lindsay East River Park, Corlear’s Hook Park, Bryant Park, Tompkins Square Park, Lower Manhattan, and throughout Hudson and Bergen counties. 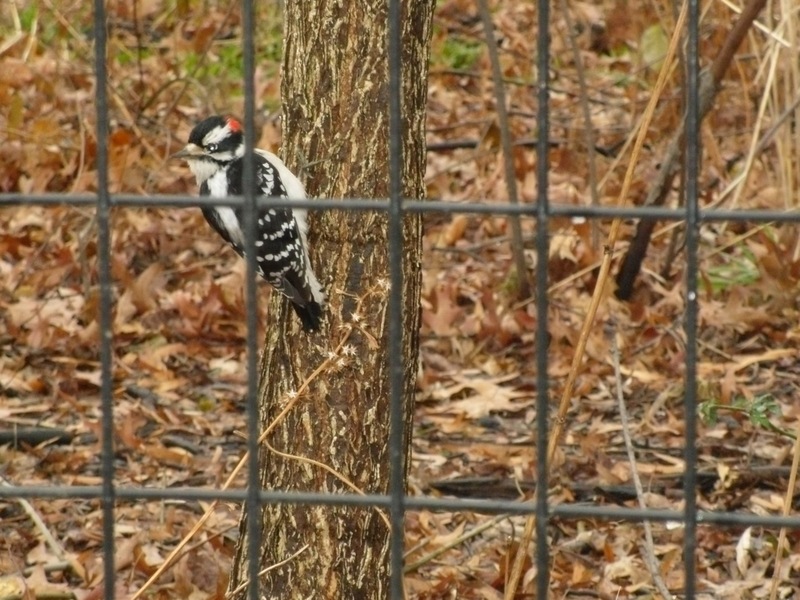 And for the first time ever a Christmas Bird Count was held at Governors Island! The final results for the NJLH count circle will be available on our Audubon Christmas Bird Count Page once all the count tallies have been submitted to us. A huge thank you to all those who participated in NYC Counts this year, especially those who led and organized counts. 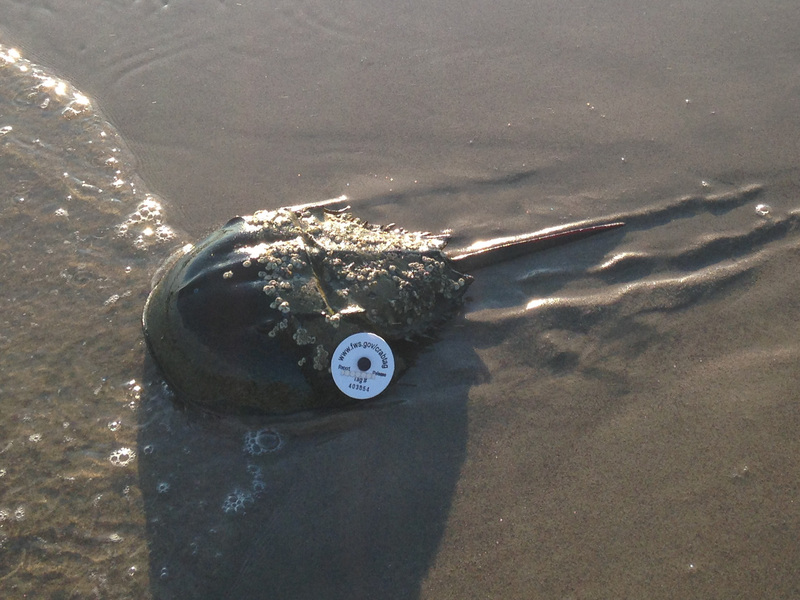 This summer NYC Audubon reached a milestone—10 years of Horseshoe Crab spawning surveys in Jamaica Bay! 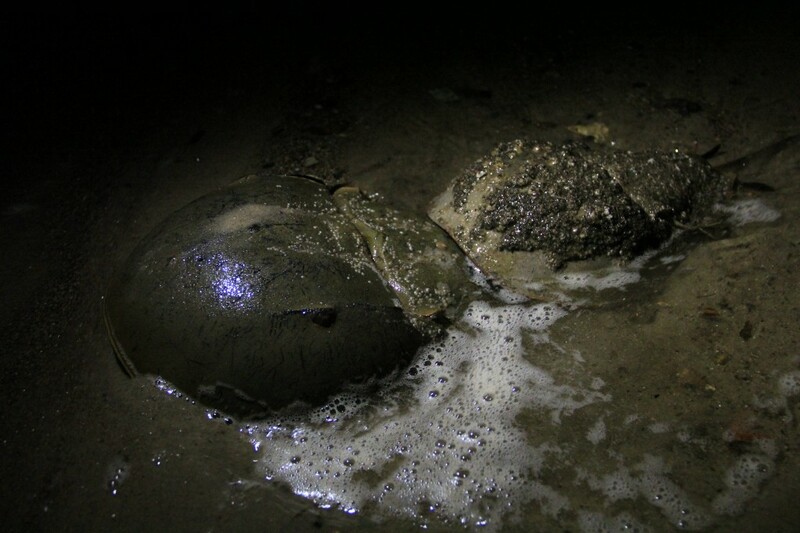 During the full and new moons in May and June, NYC Audubon conservation staff and dedicated volunteers ventured out at night to count and tag spawning Horseshoe Crabs, a critical food source for shorebirds like the threatened Red Knot. 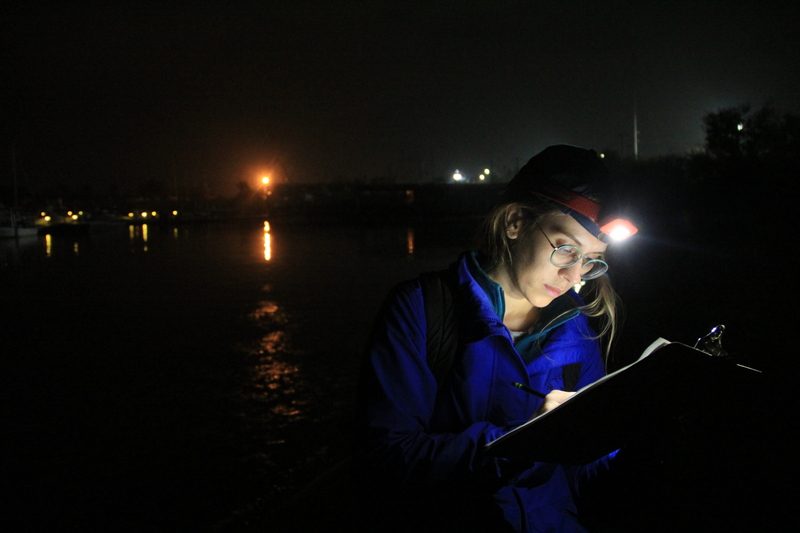 Nearly 200 community scientists braved the unpredictable weather and late nights to help with monitoring at Jamaica Bay this year, including groups from Patagonia, the Metropolitan Society of Natural Historians, P.S. 9 Teunis G Bergen, and the Trinity School. Our Horseshoe Crab monitoring and tagging efforts are part of a larger project run by the New York State Department of Environmental Conservation and Cornell University Cooperative Extension. 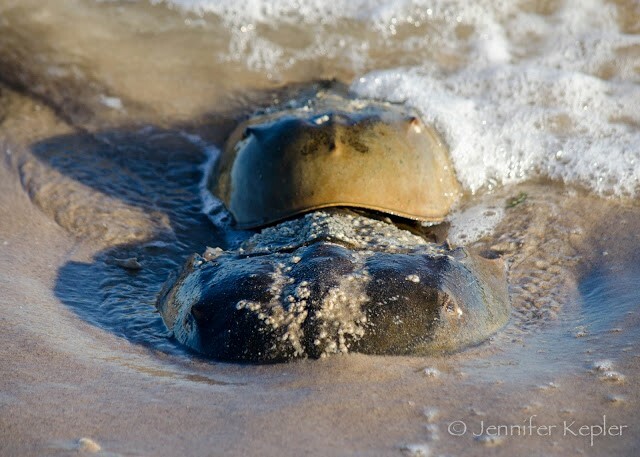 Our preliminary results indicate Horseshoe Crab numbers are remaining stable in Jamaica Bay. Overall spawning peaked around the full moon on May 29. Spawning activity numbers at Big Egg Marsh this year were more than double the area’s 2017 numbers, making it this year’s most active beach. Big Egg Marsh also peaked slightly earlier than the other beaches, with 326 crabs in our quadrat sampling on May 17. On June 28, despite adult crabs being scarce, Big Egg Marsh volunteers reported thousands of tiny, newly hatched Horseshoe Crabs in the surf. Spawning activity declined slightly at Plumb Beach East and West. Plumb Beach East had a peak 185 crabs in quadrat sampling on May 29, while Plumb West had a high count of 30 crabs in quadrats on May 31. Dead Horse Bay’s numbers were the highest they have been in four years, with 2,200 total crabs found on the beach on the night of May 31. 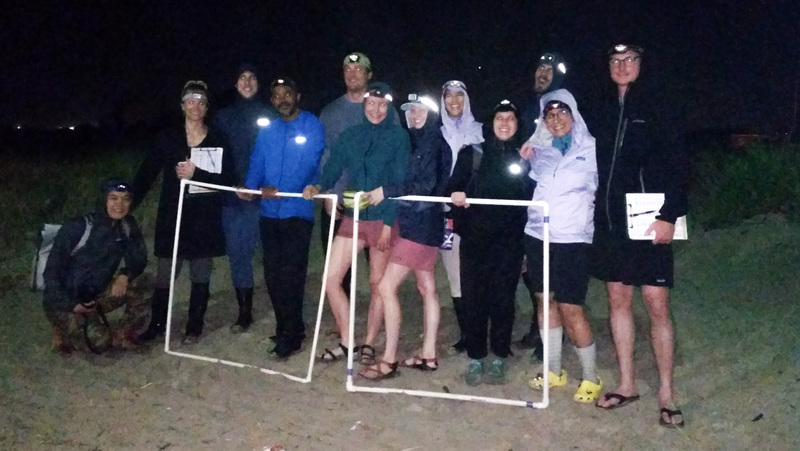 Dead Horse Bay is a “full count” where we count every crab on the beach instead of taking quadrat samples, so it took volunteers until 12:30am to count them all! We were also able to tag 800 Horseshoe Crabs this year, bringing the total number of crabs tagged throughout the program’s 10-year history to 5,980! Of those 800, 82 crabs were resighted later in the season at the same beach. We also spotted 11 crabs that had been tagged in Jamaica Bay by NYC Audubon in previous years; six of these were tagged in 2017, two in 2016, and three in 2015. Six crabs were spotted at Jamaica Bay that had been tagged elsewhere: Fire Island, Long Island, in 2012; Breezy Point, Queens, in 2012; Pikes Beach, Long Island, in 2015; Pikes Beach, Long Island, in 2016; and two from Calvert Vaux Park, Brooklyn, in 2017. These tag resightings help us learn about the importance of Jamaica Bay to the overall New York State Horseshoe Crab population. This important work would not be possible without the dedication of our site coordinators Andy Martin, Christine Nealy, Ann Seligman, and Dottie Werkmeister. We also thank Patagonia, The U.S. Fish and Wildlife Service Neotropical Migratory Bird Conservation Act grant program, National Park Service, Elizabeth Woods and Charles Denholm, and NYC Parks for their support of this year’s monitoring. Tribute in Light, September 11, 2018, 8:40 p.m.
On September 11, two powerful beams of light once again projected more than four miles into the night sky from Lower Manhattan. Known as the Tribute in Light, this annual light installation beautifully honors the thousands of lives lost on September 11, 2001. 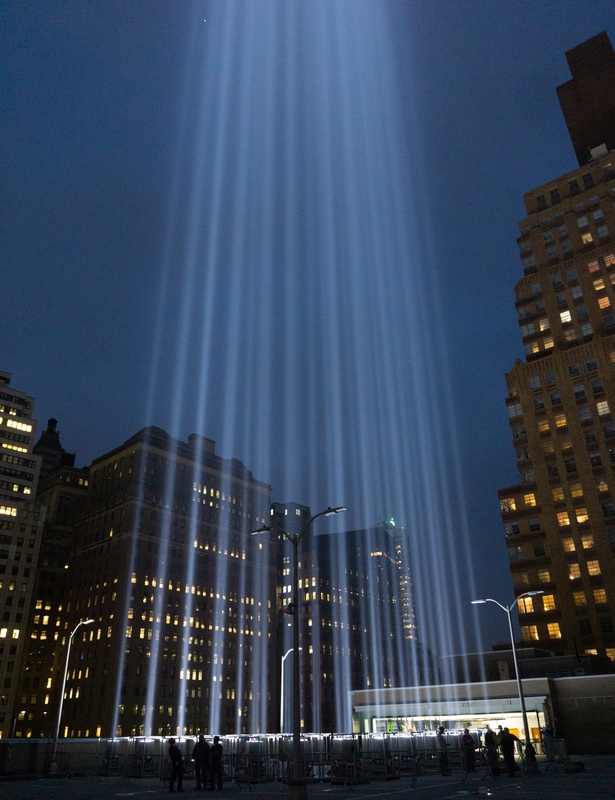 The Tribute is a stirring and fitting reminder of the tragic events of 9/11, but it can also be a hazard for hundreds of thousands of migratory birds that travel through the city under the cover of darkness during their fall migrations. Birds are attracted to light, and can end up trapped in the Tribute’s powerful beams—circling, calling, and wasting precious body fat that fuels their migratory flight. Since 2002, New York City Audubon has monitored the Tribute in Light to look for birds that have become caught in the beams. An agreement was put in place in 2005 with the producers of the Tribute (now the National September 11 Memorial & Museum and Michael Ahern Production Services) to turn off the lights for a brief period if need be to allow any trapped birds to disperse. The agreement allows this important Tribute to continue honoring the lives lost on 9/11 while minimizing the Tribute’s impact of night-migrating birds. We deeply thank National September 11 Memorial & Museum and Michael Ahern Production Services for their continued consideration of the birds. 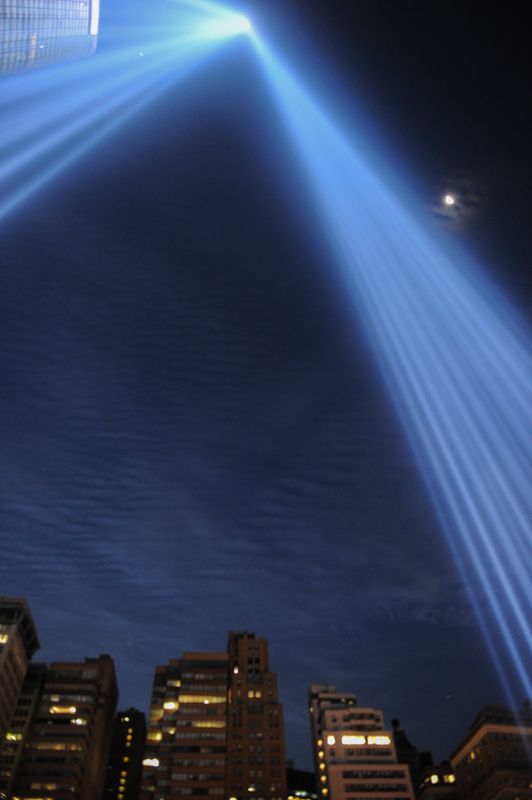 Weather and migration patterns strongly influence the number of birds we see at the Tribute in Light. This year we arrived at the Tribute concerned: the weather was clearing up after a recent rash of storms, meaning migrant birds might take flight in large numbers that night. Additionally, there were low-level clouds and increasing fog, factors that can cause birds to be drawn to strong beams of artificial light at night in large numbers. NYC Audubon staff and volunteers were joined again this year by scientists from the BirdCast team at the Cornell Lab of Ornithology. Team members installed an automatic acoustic recording unit to record avian flight calls and also kept us apprised of bad weather and birds heading for NYC as seen on their radar maps. As the sun set and the beams became visible, all eyes were on the sky. 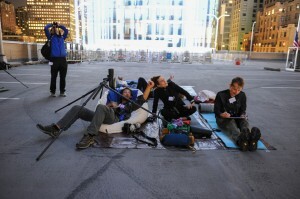 The number of birds began increasing around 10 p.m., circling high in the beams where the lights met in the sky. Eventually, birds became visible lower in the beams. Yellow Warblers, Ovenbirds, American Redstarts, and others could be clearly seen and heard calling above our heads. Another concern this year was 50 West Street, a tall building constructed in 2016 that rises directly next to the lights of the north beam. Birds could be seen fluttering dangerously close to the glass facade. At 10:50 p.m. NYC Audubon’s Dr. Susan Elbin requested the lights be turned off for 20 minutes for the safety of the birds. Once the lights were turned back on, our team was pleased to observe that not only had the birds dispersed, but the number of migrants in the area (as seen on Cornell Lab’s radar map) had declined—possibly grounded by weather to the north of us. Over the next few hours only occasional small groups of birds could be seen flying through the beams. The lights were again shut off for a brief period at 2:15 a.m., when we observed birds flying low over the lights and perilously close to the reflective glass of 50 West Street. The night went on without further incident, and as the sun rose at 6:00 a.m. our stalwart team observed the few remaining birds hunting insects as the beams faded into the sunrise. In addition to bird monitoring, we once again recorded bat echolocation calls at the Tribute. This year friends from the NYC Bat Group and Bat Conservation International joined and brought the latest in bat recording technology (donated by Wildlife Acoustics) for us to try out. Using the technology we were able to detect Eastern Red Bats and Hoary Bats hunting in the beams. 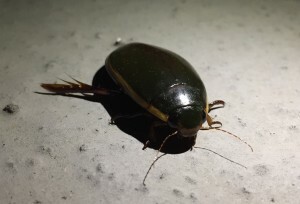 We were also joined for the second year in a row by Graham Montgomery, a scientist from the University of Connecticut who worked with the lighting crew to collect arthropod specimens that settled on the spotlights. We look forward to learning the results from this years’ observations as soon as the team members recover from their ‘all-nighter’ of observation and complete the analysis. 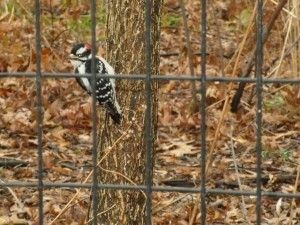 Be sure to check out NYC Audubon’s Facebook page or our Twitter page for more photos and video from the event. To learn more about the work NYC Audubon does to protect migrating birds, visit our Project Safe Flight page. New York City Audubon’s Project Safe Flight program is made possible by the leadership support of the Leon Levy Foundation. 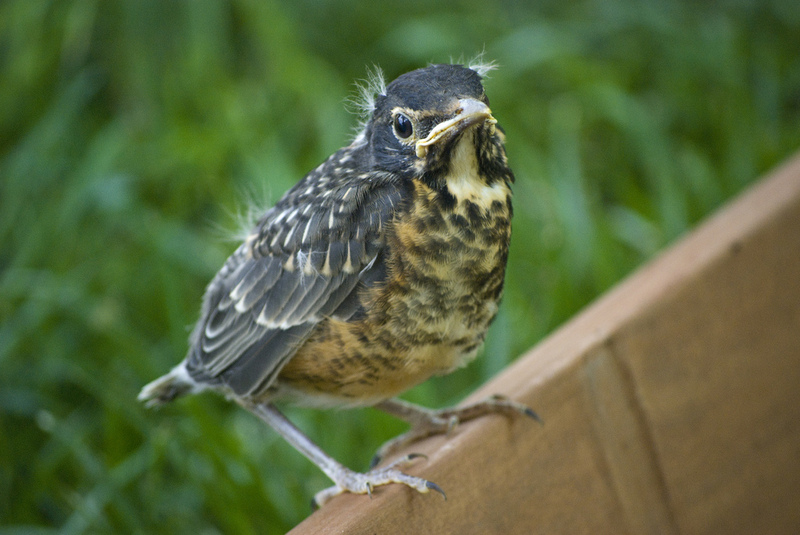 From time to time, you may come across a young or injured bird that needs assistance. It is important to follow proper steps to make sure you are helping these birds and not further harming them. If you find a bird, first determine its age. If the bird is not fully feathered, it is a nestling and needs to be returned to its nest. Contrary to popular belief, birds do not have a well-developed sense of smell, and therefore the parents won’t know if the baby has been touched by humans and will not abandon it. If the nest is intact, put the baby back in and watch from a distance to see if the parents are visiting the nest. If you cannot find or reach the nest, you can put the nestling in a box that has holes poked in the bottom for drainage and suspend the box near where the nest is located. If the young bird is fully feathered, has a short tail and wings, and is able to hop or take short flights, it is a fledgling and can most likely be left alone. 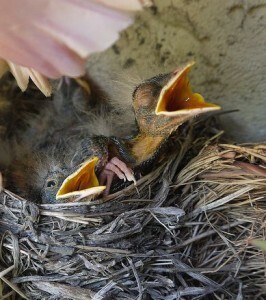 Young birds often leave the nest with weak flight muscles and are fed outside the nest for a few days by their parents. If the bird is in immediate danger (for example, it is on a sidewalk or road), move the bird off to a safer spot like the top of a bush or shrub nearby. Do not return the bird to the nest; it has outgrown its former home and will quickly hop back out. Despite your urge to take in the young bird, its parents are far better at feeding it and teaching it survival skills than any human, and taking in a young bird of a native species is illegal. An adult bird on the ground unable to fly is probably injured. Slowly approach the bird, and if it doesn’t fly away when you’re within 10 feet or so, you can assume something’s wrong. Approach the bird from behind and scoop it up firmly. Carefully put it in a box with a lid or a towel over the top (or better) in an unwaxed paper bag clipped shut. Handle the bird as little as possible and do not force feed it or give it water. Birds go into shock very easily when injured, and often die from the shock. If the bird shows visible signs of injury (unable to flutter wings, bleeding, wings drooping unevenly, weak or shivering), it needs to be taken to a wildlife rehabilitator. You can find a list of rehabilitators in New York City here. If you are unable to take the bird to a rehabilitator yourself, call NYC Audubon at 212-691-7483 to see if someone from our network of volunteers can pick up the bird and transport it. If a bird has hit a window and is still alive, it may just be stunned and need a little time to regain its senses, after which it may be able to fly away. If there are cats or other predators nearby, place the bird in an enclosed bag or box and keep it in a safe, quiet, dark place. In a few hours, or once you hear the bird begin to flutter around, open the bag or box and place it on the ground to give the bird a chance to fly out. If the bird doesn’t fly away on its own, it needs to be taken to a wildlife rehabilitator. Just as important as saving the bird, you can also make a valuable contribution to our Project Safe Flight research and contribute to our understanding of bird collisions in New York City by logging the injured bird on D-Bird, our crowd-sourced bird collision data collection tool, on your smartphone or computer at www.d-bird.org. New York, NY, May 17, 2018. 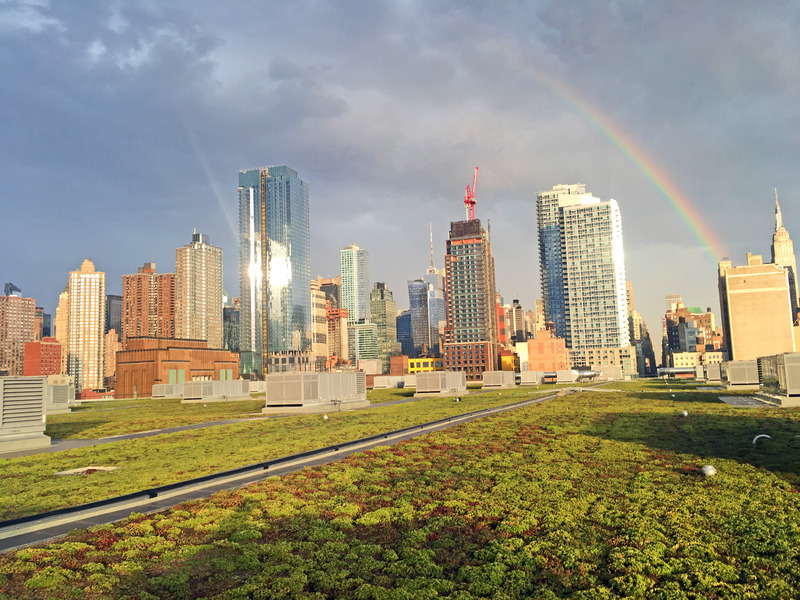 The NYC Green Roof Researchers Alliance will hold its first annual conference, “The State of Green Roofs in New York City,” to discuss cutting-edge research on urban green roofs on Thursday, June 7, at The New School. This is the first-ever forum on the emerging fields of green roof science, policy, and education. Coordinated by NYC Audubon with funding from The New York Community Trust, the NYC Green Roof Researchers Alliance is a consortium of over 50 researchers, educators, and policymakers from 17 New York City and State institutions. 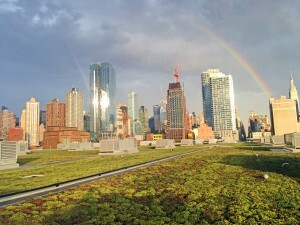 It is investigating the potential benefits of green roofs, developing a comprehensive overview of green roofs in New York City, and working to expand them across the cityscape. New York City’s one million rooftops add up to a vast underutilized landscape that could be harnessed to make a more resilient and equitable urban environment. If effectively designed and sited, green roofs can soak up stormwater to reduce sewage overflows that pollute the city’s waterways, filter air pollution, moderate extreme heat, decrease carbon emissions, and create habitat for wild birds, bats, and pollinators. The conference will open with a keynote by Alan Steel, CEO and President of the Jacob K. Javits Convention Center, which installed the largest and most studied green roof in the city (and one of the largest in the country) when the center was renovated in 2013. Topics to be covered at the conference include the development of a map and database of New York City green roofs, the use of green roofs by birds, bats, and insects, and the effects of green roofs on stormwater retention, energy use, and the urban heat island effect. Presenters will give an overview of policies that have expanded the use of green roofs in other cities and the ways in which New York City educators are using green roofs for science instruction. Free and open to the public. Space is limited. Pre-register at bit.ly/GreenRoofsNYC. The event is sponsored by the Urban Systems Lab at The New School and NYC Audubon, and co-sponsored by the Civic Liberal Arts Program at Eugene Lang College and the Environmental Studies Program at The New School. The NYC Green Roof Researchers Alliance is underwritten by The New York Community Trust, A.P.J. O’Connor Fund, and the LuEsther T. Mertz Fund. The 118th annual Audubon Christmas Bird Count for the New Jersey Lower Hudson (NJLH) count circle took place on Sunday, December 17. Our count circle is centered in the Hudson River, and its 15-mile radius includes Manhattan, Bergen and Hudson counties in New Jersey, and a portion of Queens. We were treated to a lovely mild winter day—and many interesting sightings! 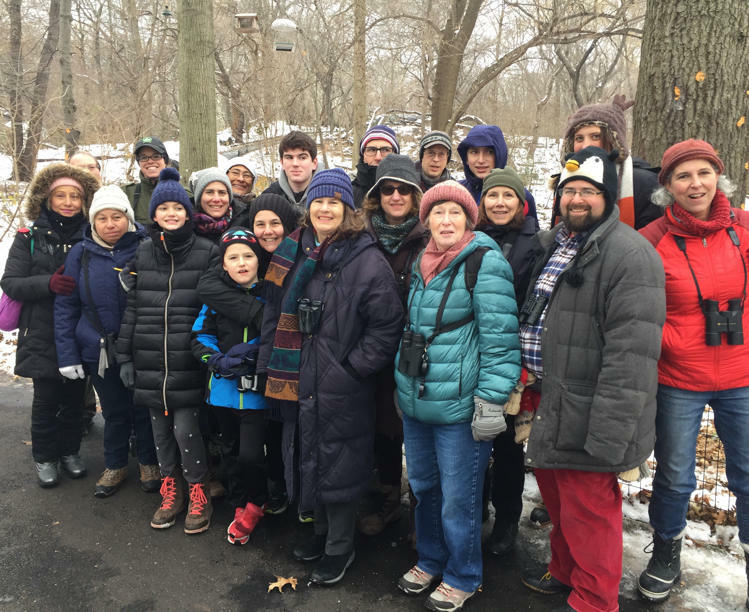 NYC Audubon organized the Central Park bird count with partners NYC Parks, the Urban Park Rangers, and the Central Park Conservancy. This year, 69 participants counted 5,592 birds of 58 species. Highlights included a boat-tailed grackle in Hallett Nature Sanctuary that later moved to Evodia Field, an ovenbird in the Central Park Zoo, two red-breasted mergansers in the Northwest Section, a white-crowned sparrow at the Pool, a common raven flyover in the Southwest Section, a northern pintail on the Pond (for the second year in a row), and two ring-necked ducks on the Reservoir. Red-breasted merganser was last counted in 1999, while the ovenbird and boat-tailed grackle appear to be firsts for the Central Park count! 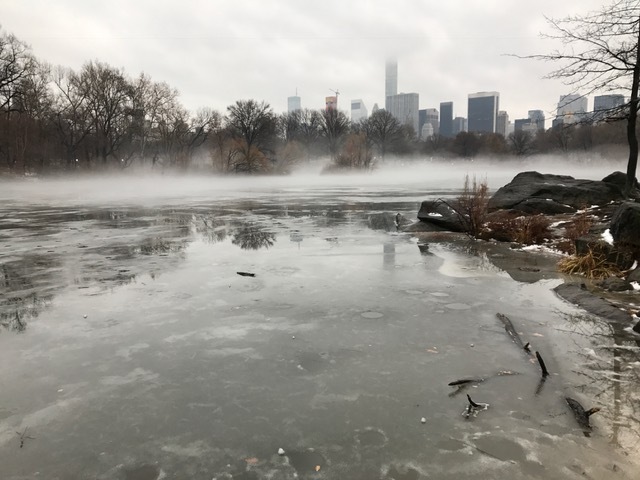 Check out our finalized tally at the end of this post for a complete list of the species found at this year’s Central Park count. This year we had low counts for tufted titmouse (12), white-breasted nuthatch (7), and black-capped chickadee (2), down from 236, 78, and 48 respectively in 2016. Interestingly, only a single individual represented each of these three species in 2013. The Hammond’s flycatcher, which had been observed in the Ramble since late November, unfortunately did not stick around for the count. During count week (the three days before and after the count), birders in Central Park reported rusty blackbird, orange-crowned warbler, northern waterthrush, pine siskin, red-shouldered hawk, and sharp-shinned hawk. In addition to Central Park, counts for our circle were held in New Jersey, Randall’s Island, Inwood Hill Park, Riverside Park, Harlem, Bryant Park, Stuyvesant Town, East River Park, Lower Manhattan, and a feeder count in Sunnyside, Queens. We also had counts during count week on Governors Island. Participants in New Jersey reported highlights such as snowy owl, American pipit, snow goose, greater yellowlegs, clay-colored sparrow, Lincoln’s sparrow, and red-shouldered hawk. Governors Island had a count week snowy owl, snow buntings, and American pipit, among others. Final results for the entire NJLH Count Circle will be available soon on our Christmas Bird Count page. Thank you to those who participated in any of the New York City counts this year, especially those who led and organized counts! Billions of birds undertake migratory journeys each spring and fall. Most of these spectacular movements go unseen, occurring under the cover of darkness. A new study published in the Proceedings of the National Academy of Sciences provides some of the most compelling evidence yet that artificial light at night causes radical changes in the behaviors of migrating birds. 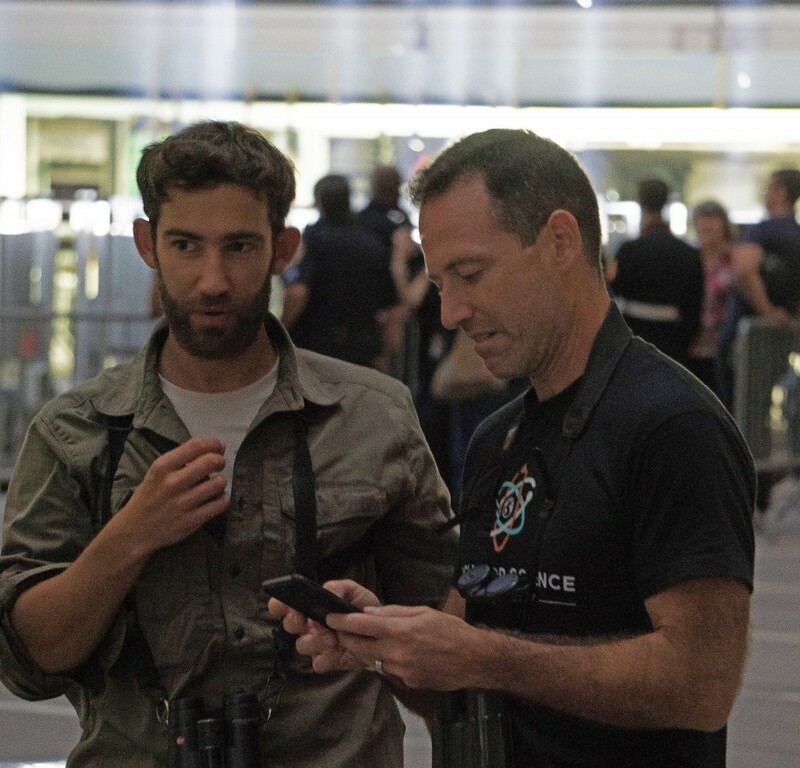 NYC Audubon collaborated with scientists from the University of Oxford and the Cornell Lab of Ornithology to study migrant bird behavior over seven years in a truly unique setting—Tribute in Light in New York City, held to commemorate the September 11, 2001 terrorist attack. 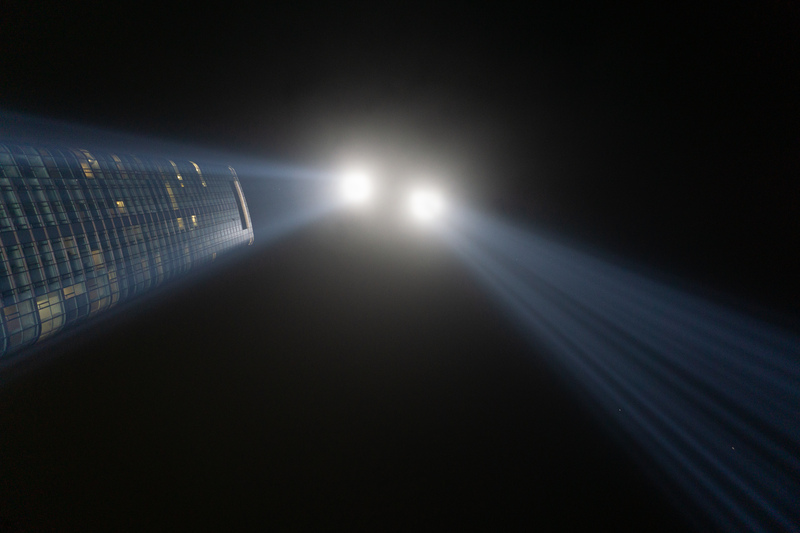 Two beams of light–each with 44 xenon bulbs of 7,000 watts—rise into the night sky, mirroring the twin towers of the World Trade Center where nearly 3,000 lives were lost. Well before the results of the study highlighted the effects of the installation, New York City Audubon reached out to the original tribute organizers, the Municipal Art Society, to let them know about the impacts of artificial light on migratory birds. In 2002, the two organizations worked together to develop a protocol to save the affected birds. 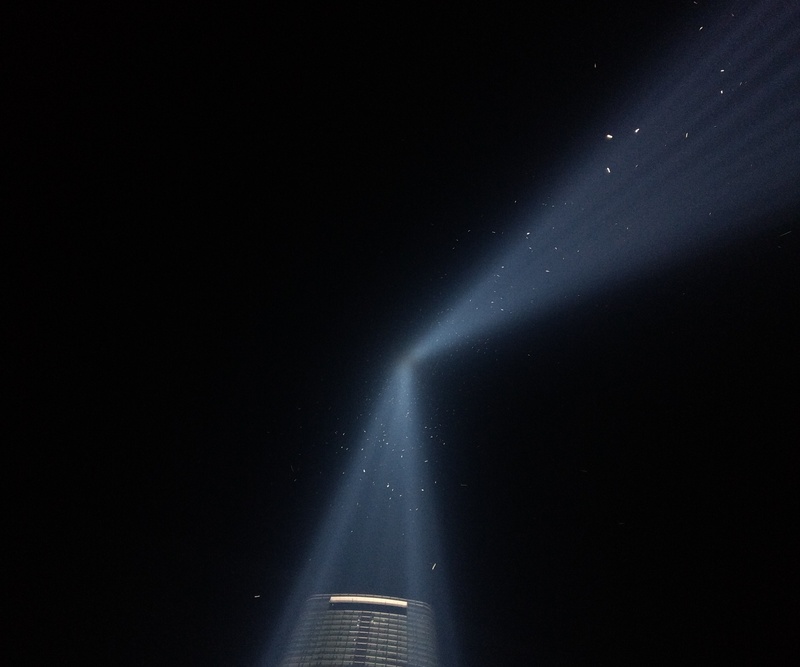 The tribute lights are turned off for approximately 20 minutes when more than 1,000 birds are seen circling in the beams or flying dangerously low with frequent calling. The National September 11 Memorial & Museum, which took over as tribute organizers in 2012, continued this practice. These brief interludes of darkness during the nightlong tribute provided a unique opportunity for the scientists to quantify changes in bird behavior in several ways during the alternating periods of light and darkness. Images above were taken 20 minutes apart during the 2015 Tribute in Light and show concentrations of birds on radar with light beams turned off (left) and turned on (right). Figure adapted from "High-intensity urban light installation dramatically alters nocturnal bird migration" in Proceedings of the National Academy of Sciences, September 2017. 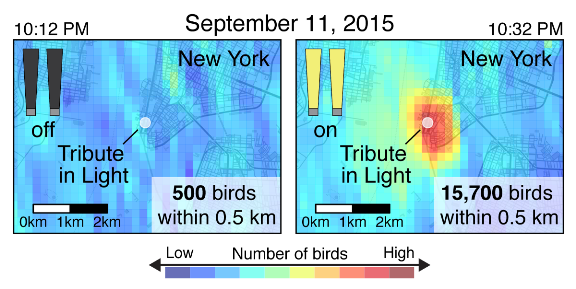 When the tribute was illuminated, the study’s authors found that densities of birds over lower Manhattan could reach 60 to 150 times the number that would typically be found in the area at that time. The concentrating effects of the intense light on the birds reached as high as four kilometers. The impact on birds was consistent even on clear nights. Many previous studies focused on the dangers posed by artificial light on nights with poor visibility. 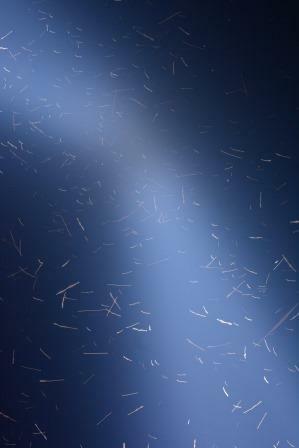 When the light beams were turned off, the birds dispersed within minutes to continue their migrations. Although Tribute in Light provided a way to measure a specific instance of light attraction, bright nighttime lighting poses problems for birds, even in rural areas. The study’s authors point out that one solution is relatively simple. This study was conducted with support from the National Science Foundation, Leon Levy Foundation, Marshall Aid Commemoration Commission, Cornell Lab of Ornithology Rose Postdoctoral Fellowship, and NASA. Every year on September 11, two beams of light illuminate the sky over Manhattan, reminding New Yorkers and the nation to pause in remembrance of those who lost their lives on 9/11/2001. New York City Audubon has monitored this important and touching tribute since 2002 to ensure it is safe for migrating birds. The beams, created using 88 7,000-watt xenon spotlight bulbs, can attract large numbers of night-migrating birds in some years. Once in the powerful beams the birds can become “trapped” and circle the lights, putting them at risk of exhaustion, disorientation, and injury. 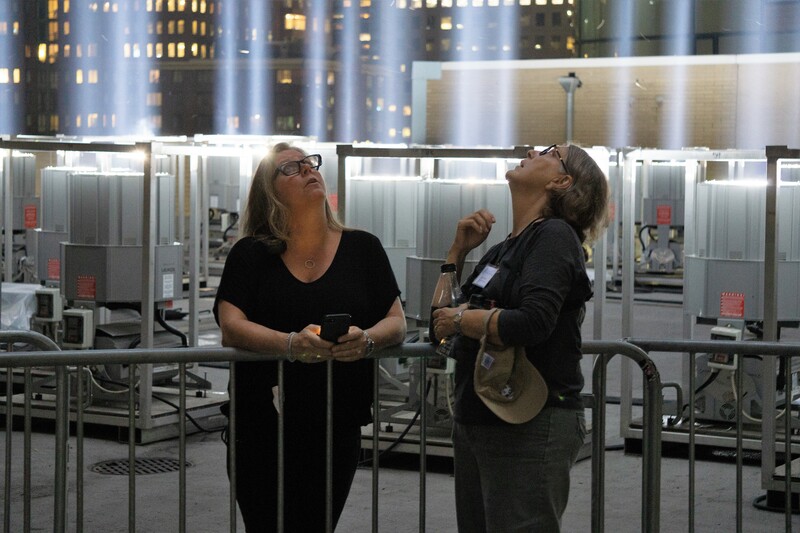 If a critical mass of birds is spotted circling at any point throughout the night, NYC Audubon works in partnership with the National September 11 Memorial & Museum and Michael Ahern Production Services to turn off the lights for roughly 20 minutes, which allows the birds to disperse. NYC Audubon staff, board members, and 35 volunteers worked together in small teams to count birds for the 10-hour duration of the tribute. Our volunteers logged a collective 137 hours of monitoring! This year we were able to station additional observers adjacent to and 28 stories above the tribute monitoring site thanks to our friends at the Battery Rooftop Garden. This new vantage point allowed us to validate the counts taken at the monitoring site below and observe the birds from a different angle. Peak migration activity typically occurs around midnight, so we were surprised to see the number of birds quickly grow at 9pm. By 9:40pm, the birds were flying low enough that their night-flight calls were audible. The lights were turned off at 9:49pm to allow the birds to disperse. When we counted over 1,000 birds at 10:55pm, the lights were shut off for a second time. The lights were switched off for a third and final time when low-flying birds became a problem at 12:30am. We confirmed in each instance using radar that the birds had left the area before the lights were turned on again. 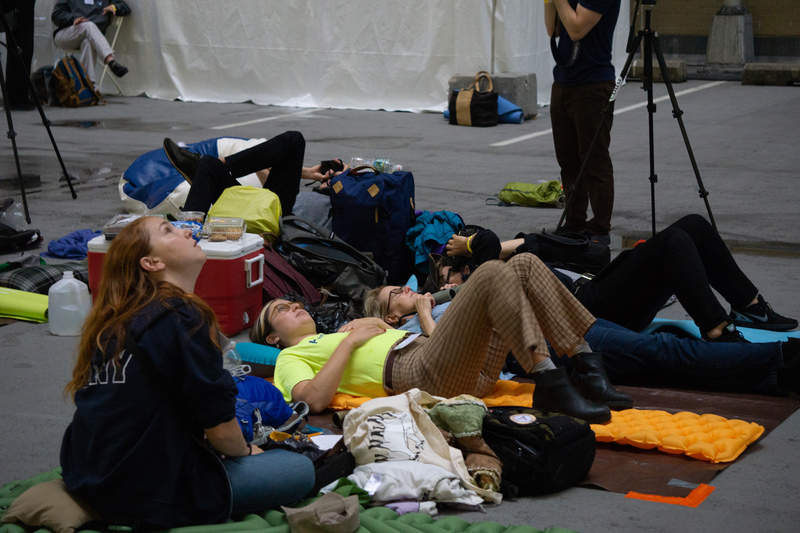 All of us at the tribute breathed a sigh of relief when bird numbers dwindled after 1am and the birds that were present appeared to pass through the beams without becoming trapped. The lights remained on until 6am. We observed many of the species that we have become accustomed to seeing in the beams, such as black-and-white warblers, northern parulas, Baltimore orioles, and American redstarts. There were also some more notable observations, including a hunting American kestrel, chimney swifts, yellow-billed cuckoos, a hummingbird, and a downy woodpecker that landed on the ledge of a nearby building. In addition to monitoring birds, we monitored bats for the second year in a row. We also added an arthropod collection component. Andrew Farnsworth and his team from Cornell joined us on the roof to record night-flight calls and monitor the birds with radar. Among the insects collected this year were a praying mantid, numerous lady beetles, and predaceous diving beetles (pictured). We also saw and recorded the echolocation calls of several eastern red bats that were taking advantage of the insects congregated in the lights. Another great horseshoe crab monitoring season has come and gone. It was quite an incredible year for horseshoe crabs in Jamaica Bay, with huge numbers of spawning horseshoe crabs at our four sites: Plumb Beach East and West, Big Egg Marsh, and Dead Horse Bay. While numbers are still preliminary, peak spawning appears to have taken place in the beginning of June. On June 11, we had 351 crabs at Plumb Beach East (in our quadrat samples), 59 at Plumb Beach West (in quadrat samples), and 1,313 at Dead Horse Bay (total count). Big Egg peaked slightly earlier, with 284 crabs in quadrat samples on May 27. While Big Egg’s numbers were down slightly from last year, overall numbers and spawning densities increased at all the other sites. This was our ninth year collecting data on horseshoe crabs, an important food source for shorebirds like the threatened red knot, in Jamaica Bay. 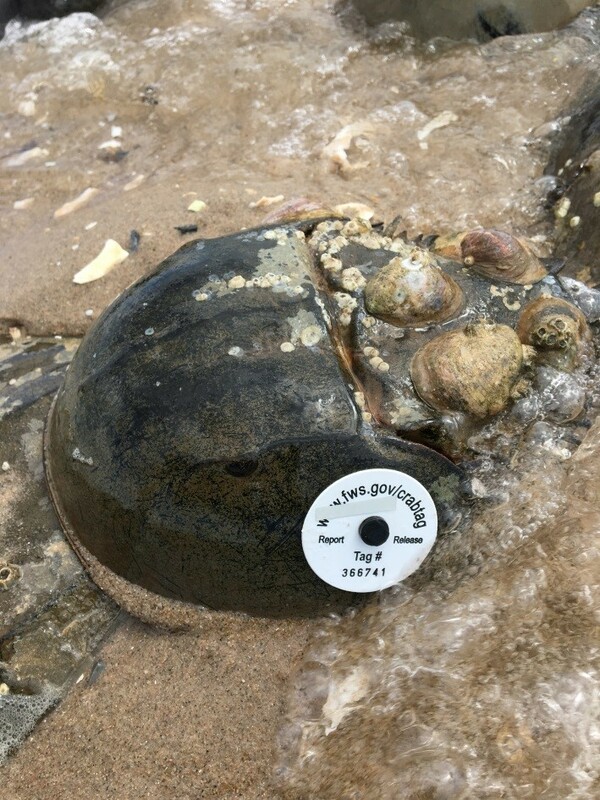 Our horseshoe crab monitoring and tagging efforts are part of a larger project run by the New York State Department of Environmental Conservation and Cornell University Cooperative Extension. Our friends from National Park Service, who monitor horseshoe crabs at Great Kills in Staten Island, had an amazing year as well. They reported finding over a thousand crabs in just one night­—more than they’d seen in an entire season in some previous years. 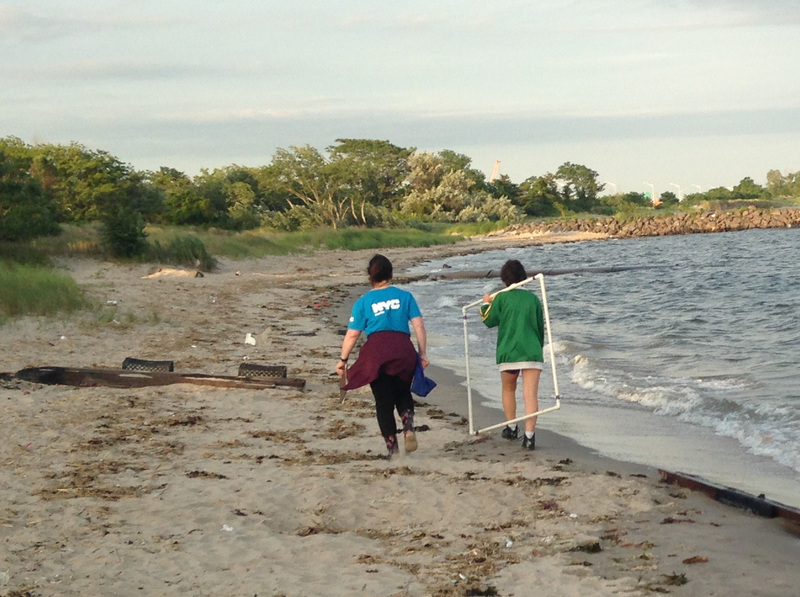 With the help of a record 206 volunteers, including groups from Patagonia, Metropolitan Society of Natural Historians, Atlas Obscura, and the Trinity School, we tagged 800 horseshoe crabs in Jamaica Bay over the course of 12 nights this summer. We learned that 70 of those tagged crabs were resighted later in the season, almost always at the same beach where they were originally tagged. Every year shows us how important these locations are for spawning crabs that use the same beach repeatedly over the course of two months—and continue to come back year after year. Of the 17 horseshoe crabs tagged at Plumb Beach West that were seen again, seven of them were resighted at Plumb Beach East. While this is still technically the same beach, it is interesting to learn that the crabs moved within this site during spawning season from the less populated west end to the more populated east end. No crabs tagged at the Plumb Beach East moved to Plumb Beach West. We also resighted 20 horseshoe crabs tagged by our program in earlier years. Eight of them were tagged by us in 2016, seven in 2015, four in 2014, and one in 2013. There were also a handful of tags resighted in Jamaica Bay that were not part of our program; we’re anxiously waiting to hear where and when they were deployed. Thank you to all of our volunteers who came out and helped with monitoring efforts this year. We of course couldn’t do this without the help of our outstanding site coordinators: Phil Cusimano, Christine Nealy, Ann Seligman, and Dottie Werkmeister. These dedicated individuals put a tremendous amount of time into making each survey go smoothly. We also want to thank National Fish and Wildlife Foundation’s Five Star and Urban Waters restoration program, Bank of America, FedEx, Patagonia, Williams Companies, and Investors Bank for their support of this year’s monitoring. We are already looking forward to next year, which will be our 10th year tracking these amazing and important creatures! The 2016 New Jersey Lower Hudson (NJLH) annual Christmas Bird Count took place on Sunday, December 18, and results are flying in! Although the morning’s forecast called for heavy rain, we only experienced a light drizzle and some morning fog before it settled into a nice, mild winter day. The NJLH Count Circle is centered right in the Hudson River and includes Manhattan, Bergen and Hudson counties in New Jersey, and parts of Queens. 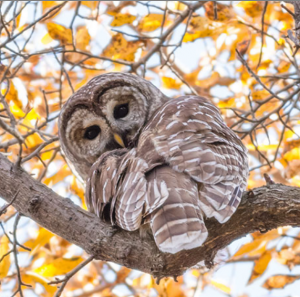 New York City Audubon organized the 117th annual Count in Central Park along with our partners from NYC Parks, Urban Park Rangers, and Central Park Conservancy. Altogether, 6,342 birds of 59 species were counted throughout the Park by over 75 participants. Highlights (bolded below) were American wigeon and Iceland gull on the Reservoir, a common yellowthroat east of the Pond, a killdeer in the North Meadow (possibly a new bird for the count! 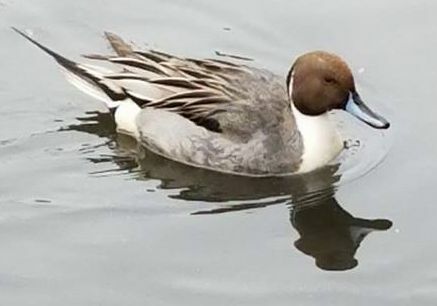 ), and a northern pintail on the Pond. Some misses were red-breasted nuthatch, cedar waxwing, and brown thrasher, though some excellent birders did report brown thrasher and red-breasted nuthatches during Count Week, which includes the three days prior and three days following the official Count. Also reported in Central Park during Count Week were snow goose (flying over), red-shouldered hawk, long-eared owl, black-throated blue warbler, hermit thrush, and green-winged teal. In addition to the Central Park Count, there were also Counts in New Jersey, Randall’s Island, Inwood Hill, Riverside Park, Harlem, Bryant Park, Madison Square Park, Stuyvesant Town, East River Park, lower Manhattan, and for the first time, a feeder in Sunnyside, Queens! There was also a Count that took place on Governors Island to see if any additional species could be added to the Island’s list. So far we’ve heard word of Baltimore orioles in various locations, a Lincoln’s sparrow in Bryant Park, and several exciting finds in New Jersey like a glaucous gull, red-headed woodpecker, Lapland longspur, seaside sparrow, and many more. Unfortunately, it seems the western tanager of City Hall Park departed just before the start of Count Week (perhaps to Queens, where one was counted during their count!). Final results for the entire NJLH Count Circle will be available soon on our website. A huge thank you to those who participated in any of the NYC Counts this year, especially those who led and organized counts throughout the City!